Join the Budo Ryu Ninjutsu Online Dojo! 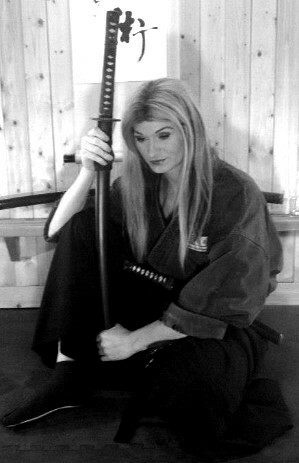 Fear (恐) within Budo, Bujutsu, Ninpo, Ninjutsu, Samuria and Shinobi. (Ying & Yang in Chinese). Fear is a distressing negative sensation induced by a perceived threat. It is a basic survival mechanism occurring in response to a specific stimulus, such as pain or the threat of danger. In short, fear is the ability to recognize danger leading to an urge to confront it or flee from it (also known as the fight-or-flight response) but in extreme cases of fear (terror) a freeze or paralysis response is possible. For this reason alone you have to understand yourself and how to read the sanshin (mind, body & spirit) within. If you understand how to look inside yourself and understand why you are feeling a specific emotional response, this gives you a greater chance for survival as now you are listening to your inner feelings, and using an educated strategy based on experience to back up the emotional gut feeling by physical action. I preach this type of strategy daily at the Budo Ryu Hombu Dojo. This is how warriors have been training for centuries; finding ways to be able to connect the mind and the body together in balance. Remember a warrior acts; only fools react. Next time you feel something such as fear, anxiety, depression or sadness, do not just react to this feeling, as you are not in balance and more than likely do something that you might regret. Act to the emotion correctly, by using your mind in balance with the inner feeling. Developing the strategy needed to follow out the objective. This can be anything from a natural feeling of fear and love, to a daily goal all the way to military procedure. This is why Budo is in everything that we do, it is who we are, and this is what separates us from the ones that simply read books on martial arts and think that they know; action from wisdom. I hope that you all enjoyed today’s lesson.